At Sheri Dettman & Associates we believe that our ability to satisfy our Palm Springs area buyer and seller clients is what is most important. For us, client loyalty leads to longevity and steady growth. Our strategy is simple: We strive to provide the highest level of service and satisfaction possible to our buyer and seller clients via a small group of real estate, administration and marketing specialists whose combined and diverse skills and talents is stronger together than individually. Through up and down cycles in the Palm Springs area real estate market we’ve been able to steadily grow our business averaging about 20% per year and we've slowly but steadily built our team of specialists (hence our newest team photo). After helping hundreds of buyer client’s find their desert home, we know that most of our buyer clients are investing in a lifestyle for their family and friends rather than just a home. After all, this is about much more than real estate, it’s about finding just the right Palm Springs area property for you and your families lifestyle and then negotiating the best price and terms possible! For our seller clients we proactively invest in a marketing strategy, which will result in bringing a large pool of qualified buyers to each of our Palm Springs area home sellers. In fact, just in the last 12 months, our team found homebuyers for sixty-two of the seventy-eight properties we sold. We welcome the opportunity to serve your real estate needs. 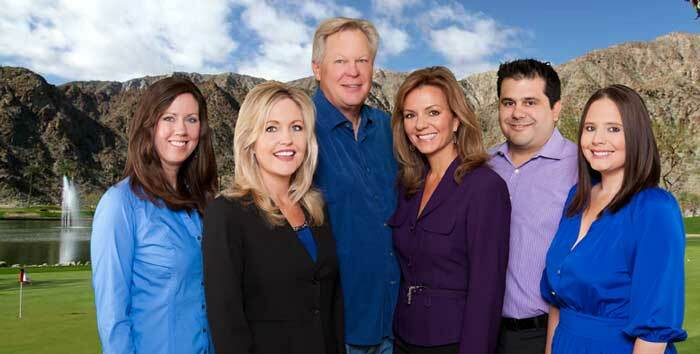 If not us, you’ll want to choose a Palm Springs area agent team that is busy, successful and experienced. Personally I choose my tax adviser, doctor and dentist the same way!